The Achilles is the large tendon that attaches the calf muscles to the heel bone, providing the strength to push off with your foot when walking, running, climbing stairs, and rising on your tiptoes. The Achilles is one of the most commonly torn tendons in the body. A tear typically occurs when performing high-impact activity such as playing basketball, soccer, or racket sports. Patients usually describe a “snapping or popping” sensation (often audible) over the back of the ankle at the time of injury and experience immediate weakness, swelling, and difficulty walking. Occasionally, the injury is not too painful, which leads to some Achilles tendon tears going undiagnosed. An Achilles tear is readily diagnosed on physical exam, and very rarely requires an MRI. An ultrasound performed in the office setting can confirm the diagnosis, and locate the precise location of the tear. Without proper healing of an Achilles tear, a person’s ability to walk, jog, jump, and perform other high impact activity will be limited. A tear can be treated either with casting or with surgical repair. Cast treatment requires 6-8 weeks of non-weight bearing cast immobilization, followed by several weeks in a walking boot, to make sure the tendon is completely healed in proper position. (Total time until boot removal is 3-4 months). Surgical repair of an Achilles can usually be performed through a small (3/4”) incision, and requires just 3-4 weeks non-weight bearing and an additional 2-3 weeks in a walking boot. (Total time until boot removal is 5-6 weeks). Surgery results in a much quicker recovery and return to regular activities than non-operative treatment, and a slightly lower rate of re-rupturing the tendon. However, most studies show that at 1 year following the injury, functional results of cast treatment and surgical repair are about equal. When your surgery has been scheduled, you will be given a pre-surgery packet which will cover location of your surgery and other important information. Patients over the age of 50 and with certain health conditions will require lab tests including a blood test and EKG and clearance from your primary care provider. Blood thinners should be discontinued prior to the surgery. This includes Coumadin, Plavix, aspirin, anti-inflammatory medicines (ibuprofen, naproxen, Aleve, Motrin, diclofenac, etc. ), glucosamine, fish oil, and herbs that may cause thinning of the blood. If you are on prescribed medicines such as Coumadin or Plavix, meet with your primary care doctor prior to discontinuation. How is the tendon repaired? 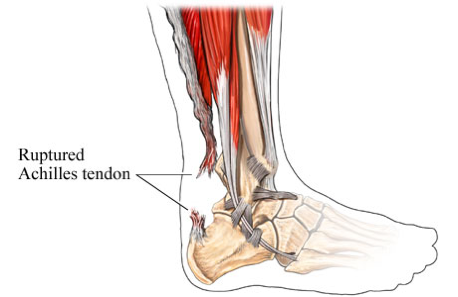 The tendon is repaired by sewing together the severed ends of the Achilles tendon. As noted above, this can usually be performed through a small (3/4”) incision, using a technique known as PARS (Percutaneous Achilles Repair System). If the rupture is recent (no more than 3 weeks old), the operation takes about an hour. This excludes anesthesia time and recovery. You will receive a pain block for this procedure. This is a process in which the anesthiologist injects numbing medicine into a nerve in the back of your knee, providing pain relief for the first 8-16 hours after the surgery. You will have an opportunity to speak with the anesthesiologist about the block prior to your surgery. You may also undergo general anesthesia for this procedure. You will be provided with a prescription for pain medicine at the time of surgery or at your pre-operative appointment. Most patients are able to discontinue the medicine within one-two weeks of the surgery. We recommend weaning off of the medicine and transitioning to over-the-counter analgesics (i.e., ibuprofen, naproxen, Tylenol) due to the side effects and addictive nature of narcotic medications. Most of the pain medicine we prescribe contains Tylenol (acetaminophen or APAP). Therefore, Tylenol should not be taken in combination with the pain medicine. It is recommended that you do not exceed 2 grams of Tylenol/day. The pain medicine we typically prescribe contains either 325 mg or 500 mg of Tylenol (APAP). Some common side effects of narcotics include itching, nausea and constipation. Should you experience these side effects, there are medicines that can be prescribed to counteract them. Because constipation is so common, consider starting and over-the-counter stool softener such as Colace. Maintain a high fiber diet (25g/day for women and 35g/day for men) and stay well hydrated. When the operation is completed, you will be placed in a non weight-bearing (NWB) plaster splint (a soft cast). You will be given crutches at the surgery center. If you have difficulty using crutches, you may want to obtain a knee scooter (roll-a-bout). Most insurance companies do not cover the cost of a knee scooter, though a prescription is often required. Please contact the office if you would like a prescription for a scooter. It is recommended that you keep your leg elevated above the level of your heart most of the time for the first 48-72 hours after your surgery. This will decrease both swelling and pain. Keep dressings dry at all times. For showering, consider covering the splint in a garbage bag, securely taping the edges. Alternatively, you may obtain a cast-cover at the office, and they are also available at the office and at most drugstores. They cost $28 and are reusable. Do not attempt to remove the splint. At your first post-op appointment, the splint will be removed. The wound is checked for proper healing, and the sutures are removed at this time. You will then be fitted with a removable walking cast (CAM walker) along with two heel lifts. The heel lifts allow for continued healing of the Achilles tendon and prevent the tendon from being overstretched. You may also remove the CAM walker a couple of times a day to perform gentle range of motion exercises with your ankle (up and down movements only). You may remove one heel lift after wearing the CAM walker for a week, and you may remove the 2nd heel lift after you can bend your ankle upwards to a 90 degree angle. This usually occurs after the 2nd week. You may start placing weight on your foot once the 2nd heel lift has been removed. Consider partial weight-bearing (placing about 50% of your weight on the operative leg), increasing to full weight-bearing (not using crutches) over the course of a few days. It is recommended that you wear the CAM walker at all times, including nighttime, for the first two weeks. However, it may be removed to shower. After two weeks of wearing the CAM walker, you may discontinue wearing it at night. You must continue to wear it during the day and whenever weight-bearing. Your second post-op appointment will take place 2-3 weeks after your 1st post-op appointment. Your ankle motion will be checked and your tendon will be evaluated for healing. You will be given a prescription for PT at your 2nd post-op appointment along with a list of physical therapy locations near your home or work. You may be allowed to begin “weaning-out” of the CAM walker over the course of several days. Once you begin PT, it is important that you perform the exercises at home on off days. You may start using the stationary bike at low resistance once cleared. At 2 months after surgery, you may start using the elliptical machine. High impact activity including jogging, jumping, and walking on uneven terrain may be attempted no earlier than 4-6 months after your surgery. We recommend gradually introducing these activities. Pain: Moderate-severe pain should decrease within a couple of weeks following the operation, however some amount of pain is common and at times can persist for 3-6 months.